STATUE OF OLAF THE WHITE. At any rate, no Irish kin coming immediately to mind, for this week’s assigned theme I resorted to an “Ireland” search of my Family Tree Maker master database. Of the distant collateral Irish kin I found, I settled Eeny, meeny, miny, moe style on, 2nd cousin 33 times removed, King Olaf the White of Dublin (ca 840 Ireland-ca 871 in battle, Ireland), son of King Ingjald the White Helgasson of Ireland. Olaf married, Aud / Auth / Unn Deep-Minded Ketilsdatter (834 Norway-900 Iceland), daughter of Ketill Flatnefur [Flatnose] Bjornsson & Ingveld Ketilsdatter. “Olaf, who was called Olaf the White, was styled a warrior king. He was the son of King Ingjald, the son of Helgi, the son of Olaf, the son of Gudred, the son of Halfdan Whiteleg, king of the Uplands (in Norway). “He led a harrying expedition of sea-rovers into the west, and conquered Dublin, in Ireland, and Dublinshire, over which he made himself king. He married Aud the Deep-minded, daughter of Ketil Flatnose, son of Bjorn the Ungartered, a noble man from Norway. Their son was named Thorstein the Red. “Olaf fell in battle in Ireland, and then Aud and Thorstein went into the Sudreyjar (the Hebrides). There Thorstein married Thorid, daughter of Eyvind the Easterling, sister of Helgi the Lean; and they had many children. “Thorstein became a warrior king, and formed an alliance with Earl Sigurd the Great, son of Eystein the Rattler. They conquered Caithness, Sutherland, Ross, and Moray, and more than half Scotland. Over these Thorstein was king until the Scots plotted against him, and he fell there in battle. “Aud was in Caithness when she heard of Thorstein’s death. Then she caused a merchant-ship to be secretly built in the wood, and when she was ready, directed her course out into the Orkneys. There she gave in marriage Thorstein the Red’s daughter, Gro, who became mother of Grelad, whom Earl Thorfinn, the Skullcleaver, married. “Afterwards Aud set out to seek Iceland, having twenty free men in her ship. Aud came to Iceland, and passed the first winter in Bjarnarhofn (Bjornshaven) with her brother Bjorn. Afterwards she occupied all the Dale country between the Dogurdara (day-meal river) and the Skraumuhlaupsa (river of the giantess’s leap), and dwelt at Hvamm. She had prayer meetings at Krossholar (Crosshills), where she caused crosses to be erected, for she was baptised and deeply devoted to the faith. There came with her to Iceland many men worthy of honour, who had been taken captive in sea-roving expeditions to the west, and who were called bondmen. “Ketill Flatnose brought his ship to Scotland, and was well received by the great men there; for he was a renowned man, and of high birth. They offered him there such station as he would like to take, and Ketill and his company of kinsfolk settled down there – all except Thorstein, his daughter’s son, who forthwith betook himself to warring, and harried Scotland far and wide, and was always victorious. Later on he made peace with the Scotch, and got for his own one-half of Scotland. He had for wife Thurid, daughter of Eyvind, and sister of Helgi the Lean. The Scotch did not keep the peace long, but treacherously murdered him. “….Unn the Deep-minded was in Caithness when her son Thorstein fell. When she heard that Thorstein was dead, and her father had breathed his last, she deemed she would have no prospering in store there. So she had a ship built secretly in a wood, and when it was ready built she arrayed it, and had great wealth withal; and she took with her all her kinsfolk who were left alive; and men deem that scarce may an example be found that any one, a woman only, has ever got out of such a state of war with so much wealth and so great a following. From this it may be seen how peerless among women she was. Unn had with her many men of great worth and high birth. A man named Koll was one of the worthiest amongst her followers, chiefly owing to his descent, he being by title a ‘Hersir.’ There was also in the journey with Unn a man named Hord, and he too was also a man of high birth and of great worth. When she was ready, Unn took her ship to the Orkneys; there she stayed a little while, and there she married off Gro, the daughter of Thorstein the Red. She was the mother of Greilad, who married Earl Thorfinn, the son of Earl Turf-Einar, son of Rognvald Mere-Earl. Their son was Hlodvir, the father of Earl Sigurd, the father of Earl Thorfinn, and from them come all the kin of the Orkney Earls. After that Unn steered her ship to the Faroe Isles, and stayed there for some time. There she married off another daughter of Thorstein, named Olof, and from her sprung the noblest race of that land, who are called the Gate-Beards. “Unn now got ready to go away from the Faroe Isles, and made it known to her shipmates that she was going to Iceland. She had with her Olaf ‘Feilan,’ the son of Thorstein, and those of his sisters who were unmarried. After that she put to sea, and, the weather being favourable, she came with her ship to the south of Iceland to Pumice-Course (Vikrarskeid). There they had their ship broken into splinters, but all the men and goods were saved. After that she went to find Helgi, her brother, followed by twenty men; and when she came there he went out to meet her, and bade her come stay with him with ten of her folk. She answered in anger, and said she had not known that he was such a churl; and she went away, being minded to find Bjorn, her brother in Broadfirth, and when he heard she was coming, he went to meet her with many followers, and greeted her warmly, and invited her and all her followers to stay with him, for he knew his sister’s high-mindedness. She liked that right well, and thanked him for his lordly behaviour. She stayed there all the winter, and was entertained in the grandest manner, for there was no lack of means, and money was not spared. In the spring she went across Broadfirth, and came to a certain ness, where they ate their mid-day meal, and since that it has been called Daymealness, from whence Middlefell-strand stretches (eastward). Then she steered her ship up Hvammsfirth and came to a certain ness, and stayed there a little while. There Unn lost her comb, so it was afterwards called Combness. Then she went about all the Broadfirth-Dales, and took to her lands as wide as she wanted. After that Unn steered her ship to the head of the bay, and there her high-seat pillars were washed ashore, and then she deemed it was easy to know where she was to take up her abode. She had a house built there: it was afterwards called Hvamm, and she lived there. The same spring as Unn set up household at Hvamm, Koll married Thorgerd, daughter of Thorstein the Red. Unn gave, at her own cost, the bridal-feast, and let Thorgerd have for her dowry all Salmonriver-Dale; and Koll set up a household there on the south side of the Salmon-river. Koll was a man of the greatest mettle: their son was named Hoskuld. “After that Unn gave to more men parts of her land-take. To Hord she gave all Hord-Dale as far as Skramuhlaups River. He lived at Hordabolstad (Hord-Lair-Stead), and was a man of the greatest mark, and blessed with noble offspring. His son was Asbjorn the Wealthy, who lived in Ornolfsdale, at Asbjornstead, and had to wife Thorbjorg, daughter of Midfirth-Skeggi. Their daughter was Ingibjorg, who married Illugi the Black, and their sons were Hermund and Gunnlaug Worm-tongue. They are called the Gilsbecking-race. Unn spoke to her men and said: ‘Now you shall be rewarded for all your work, for now I do not lack means with which to pay each one of you for your toil and good-will. You all know that I have given the man named Erp, son of Earl Meldun, his freedom, for far away was it from my wish that so high-born a man should bear the name of thrall.’ Afterwards Unn gave him the lands of Sheepfell, between Tongue River and Mid River. His children were Orm and Asgeir, Gunbjorn, and Halldis, whom Alf o’ Dales had for wife. To Sokkolf Unn gave Sokkolfsdale, where he abode to old age. Hundi was the name of one of her freedmen. He was of Scottish kin. To him she gave Hundidale. Osk was the name of the fourth daughter of Thorstein the Red. She was the mother of Thorstein Swart, the Wise, who found the ‘Summer eeke.’ Thorhild was the name of a fifth daughter of Thorstein. She was the mother of Alf o’ Dales, and many great men trace back their line of descent to him. His daughter was Thorgerd, wife of Ari Marson of Reekness, the son of Atli, the son ofUlf the Squinter and Bjorg, Eyvond’s daughter, the sister of Helgi the Lean. From them come all the Reeknessings. Vigdis was the name of the sixth daughter of Thorstein the Red. From her come the men of Headland of Islefirth. “Olaf ‘Feilan’ was the youngest of Thorstein’s children. He was a tall man and strong, goodly to look at, and a man of the greatest mettle. Unn loved him above all men, and made it known to people that she was minded to settle on Olaf all her belongings at Hvamm after her day. Unn now became very weary with old age, and she called Olaf ‘Feilan’ to her and said: ‘It is on my mind, kinsman, that you should settle down and marry.’ Olaf took this well, and said he would lean on her foresight in that matter. Unn said: ‘It is chiefly in my mind that your wedding-feast should be held at the end of the summer, for that is the easiest time to get in all the means needed, for to me it seems a near guess that our friends will come hither in great numbers, and I have made up my mind that this shall be the last bridal feast arrayed by me.’ Olaf answered: ‘That is well spoken; but such a woman alone I mean to take to wife who shall rob thee neither of wealth nor rule (over thine own).’ That same summer Olaf ‘Feilan’ married Alfdis. Their wedding was at Hvamm. Unn spent much money on this feast, for she let be bidden thereto men of high degree wide about from other parts. She invited Bjorn and Helgi ‘Bjolan,’ her brothers, and they came with many followers. There came Koll o’ Dales, her kinsman-in-law, and Hord of Hord-Dale, and many other great men. The wedding feast was very crowded; yet there did not come nearly so many as Unn had asked, because the Islefirth people had such a long way to come. Old age fell now fast upon Unn, so that she did not get up till mid-day, and went early to bed. No one did she allow to come to her for advice between the time she went to sleep at night and the time she was aroused, and she was very angry if any one asked how it fared with her strength. On this day Unn slept somewhat late; yet she was on foot when the guests came, and went to meet them and greeted her kinsfolk and friends with great courtesy, and said they had shown their affection to her in ‘coming hither from so far, and I specially name for this Bjorn and Helgi, but I wish to thank you all who are here assembled.’ After that Unn went into the hall and a great company with her, and when all seats were taken in the hall, every one was much struck by the lordliness of the feast. Then Unn said: ‘Bjorn and Helgi, my brothers, and all my other kindred and friends, I call witnesses to this, that this dwelling with all its belongings that you now see before you, I give into the hands of mykinsman, Olaf, to own and to manage.’ After that Unn stood up and said she would go to the bower where she was wont to sleep, but bade every one have for pastime whatever was most to his mind, and that ale should be the cheer of the common folk. So the tale goes, that Unn was a woman both tall and portly. She walked at a quick step out along the hall, and people could not help saying to each other how stately the lady was yet. They feasted that evening till they thought it time to go to bed. But the day after Olaf went to the sleeping bower of Unn, his grandmother, and when he came into the chamber there was Unn sitting up against her pillow, and she was dead. Nearest common ancestor shared by Olaf the White & myself, Olaf’s’s Great-Grandfather & my 34th Great-Granddad, Sigurd “Snake-in-Eye,” Ragnarson, aka Sigurd Worm-in-Eye / Sigurd Dragon eye / Sigurd Snake-in-the-eyes (so named for a snake-shaped mark in his left eye). IMAGE: Statue of Olaf the White from “Art & Architecture of the Middle Ages” blog of Danielle Penney, “Dublina and the Vilking World” post, at http://artarchitectureofthemiddleages.blogspot.com/2012/07/statue-of-olaf-white-viking-king-in.html , accessed Mar., 2015. Statue location not indicated. 2 “The Icelandic Saga Database,” “Eyrbyggja Saga” / “Saga of the Ere-Dwellers,” Chapter 1, “Herein Is Told How Ketil Flatneb Fares To West-Over-Sea,” at http://sagadb.org/eyrbyggja_saga.en , accessed Mar., 2015. IMAGE: “Ketill Flatnose:” “Temple of Our Heathen Gods Resource Website” (contact, mark@heathengods.com), “Temple of Our Heathen Gods Temple Library,” at http://www.heathengods.com/library/book_sagas/sagas-12.html , accessed Mar., 2015. 3 “The Icelandic Saga Database,” “Eiríks saga rauða” / “The Saga of Erik the Red,” English translation by J. Sephton, 1880, at http://www.sagadb.org/eiriks_saga_rauda.en , accessed Mar., 2015. 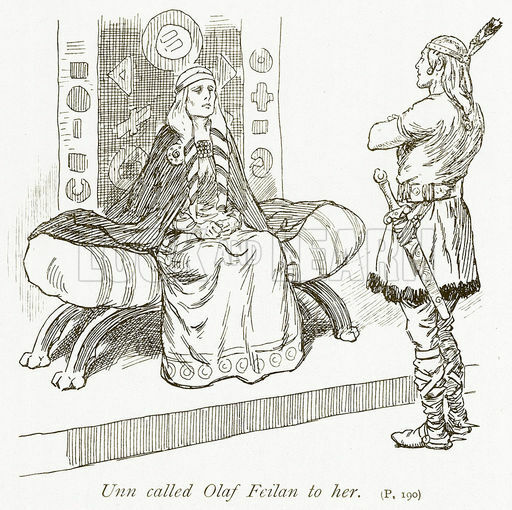 IMAGE: “Unn called Olaf Feilan to her:” LookAndLearn.com, at http://www.lookandlearn.com/history-images/M821990/Unn-called-Olaf-Feilan-to-her?img=32&search=sagas&bool=phrase , accessed Mar., 2015. 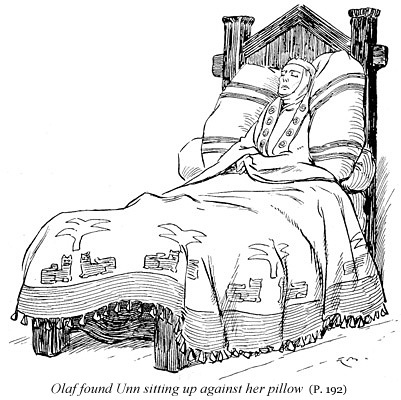 IMAGE: “Olaf found Unn sitting up against her pillow:” “Temple of Our Heathen Gods Resource Website” (contact, mark@heathengods.com), “Temple of Our Heathen Gods Temple Library,” at http://www.heathengods.com/library/book_sagas/sagas-12.html , accessed Mar., 2015. 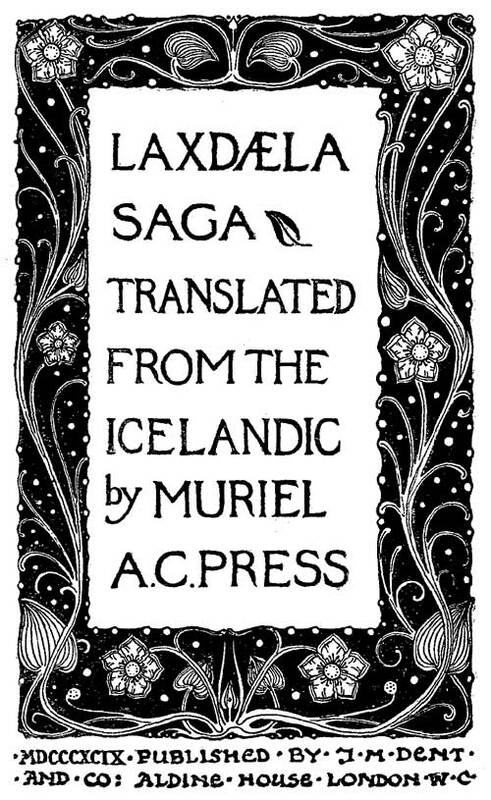 4 “The Icelandic Saga Database,” “Laxdæla Saga,” / “Laxdale Saga,” the “Laxdæla Saga,” English translation Muriel A. C. Press, 1880, at http://sagadb.org/laxdaela_saga.en , accessed Mar., 2015. This entry was posted in 52 Ancestors in 52 Weeks: 2015 Edition, Genealogy, Royals, Vikings and tagged Aud Deep-Minded Ketilsdatter, Olaf the White. Bookmark the permalink. Hi – We must be related. Flatnose was my 35 times great-grandfather. Yes, then we must be! 😀 LOL, I couldn’t even begin to do the calculations though. Cousins of some degree, I reckon. Do you have a family tree online?